NRIND NRMRA, It is Federal in architectural style with the square form and a chimney at each end. Its formality, including the very inclusion of a dining room, marks the refinement and high taste of the period; much attention to detail in arrangement of window panes, sashes and yet, the old oak beams are still held together by wooden pegs. Original owner of land - Samuel Blanchard/Stephen Osgood, of house: John Flint. The section West Parish bounded by Lovejoy and Dascomb Roads to Haggett's Pond and Tewksbury line was once called “Blanchard's Plain”. Samuel Blanchard owned land as early as 1662 in "West Andover". 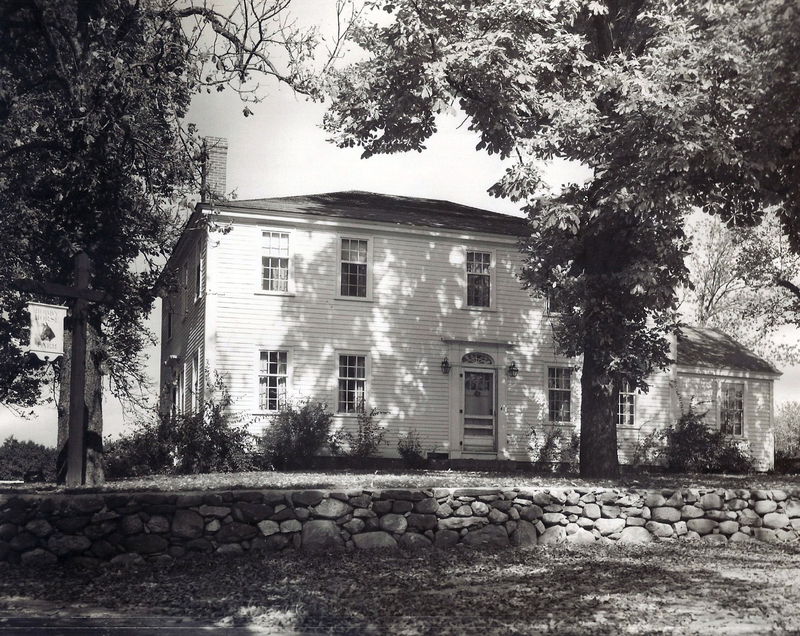 Moved here from Charlestown later with 2nd wife and had garrison house on Haggetts Pond Road; served as selectman 1683, died in 1707 first burial of record in West Parish Cemetery. His daughter Hannah and husband Stephen Osgood, gave this land to their son, Joshua in 1750. Joshua married Mary Flint and presumably had house here, but no longer exists. Joshua left his dwelling place and barns to his son, Joshua Osgood Jr., who lived here until 1801. Joshua sold to is brother Kendall Osgood who then sold out to John Flint, probably a cousin, of Reading. Steven b. June 22, 1700, Hannah b. Mar. 4, 1701-2, dau. b. July 8, 1704, child (Jacob?) b. Aug. 18, 1709 – d. Dec. 7, 1724, Lydia bpt. Mar 9, 1712, Isaack bpt. Feb. 21, 1714, Lydia T. C. b. Oct. 20, 1716, Joseph b. Apr. 11, 1717, David b. Feb. 25, 1718-19 – d. Feb. 8, 1741-2, Rachael b. Jan 7, 1720-21 and Joshua Jr. b. July 17, 1724. Stephen died on Jan. 10, 1749-50. Hannah died on Mar. 16, 1774 at age 93. Mary Flint of Reading. Joshua and Mary had five children: Mary b. Oct. 8, 1754 – d. Nov. 9, 1754, Joshua bpt. July 17, 1757, Joshua b. July 16, 1759, Aaron b. Oct. 11, 1760 and Mary b. Oct. 15, 1766. Joshua sold the 90 acre farm for 210 pounds to his brother Kendall Osgood, of Peterborough, NH, physician, on Nov. 22, 1785. Other parcels came later. Kendall sold to John Flint a 100 acre farm for 500 pounds on June 4, 1795. John Flint was born b. Feb 16, 1768, son of Samuel & Ede (Upton) Flint. John, a Yeoman, married Ruth Upton b. Apr. 6, 1773 dau. of Amos Upton. John & Ruth had five children: John b. Feb. 21, 1792 Danvers, Henry b. May 4, 1794 Danvers, Lucinda b. Oct. 30, 1796, Elizabeth b. Dec. 19, 1806 and Alanson b. Oct. 19, 1806. 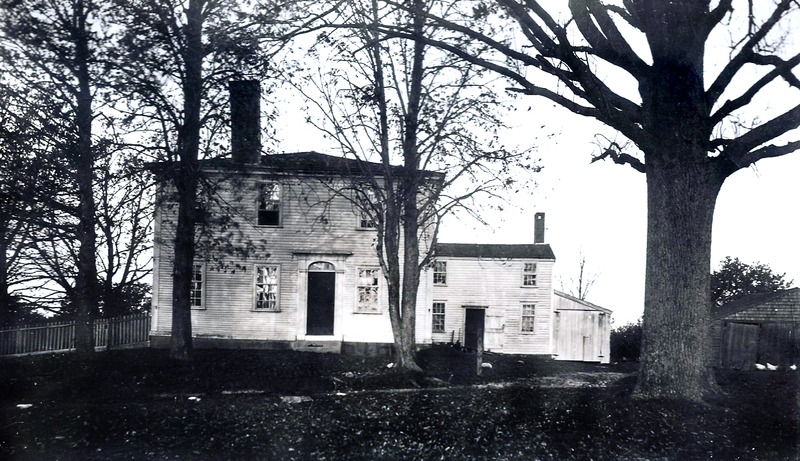 John Flint began building house 1809 and completed it in 1811. John died on Sept. 4, 1824 age 54, willing the house to his third son, Alanson Flint. Ruth died on May 23, 1843 age 70 years. Alanson married Dec. 11, 1828 to Hannah Griffin b. Sept. 25, 1811 dau. of Joshua & Hannah Griffin. Alanson and Hannah had seven children: Maria Henrietta b. Oct. 11, 1829, Alanson Augustus & Addison Augustine twins b. Nov. 17, 1831, Henry Kirk b. Feb. 7, 1834, John Warren b. July 14, 1836 – d. Nov. 13, 1837, Charles William bpt. July 21, 1839, and Hannah Griffin bpt. Oct. 17, 1841- d. Jan. 31, 1843. Alanson and Hannah joined the West Parish Church on Mar. 1, 1839. The 1850 Andover Valuation schedule list Alanson Flint: Dwell. house $1000., Barn and other build. $225., 90 acre farm $1890. Farm stock $20. Alanson died on Dec. 25, 1891 and wife Hannah died Oct. 18, 1894. Flint’s heirs, Henry K. Flint, Maria H. Flint sold the Flint farm with 69 acres to Mary D. Way on May 7, 1895. Mary Dearborn Way was the widow of Francis Way. Mary was born April 1817 in Northfield, NH dau. of Ezrail & Mary (Hersey) Corfran. Mary & Francis had one son Clarence J. Way b. Oct. 1851 in Prairie Creek, Iowa. Clarence was a moulder in Lowell when he married on Nov. 30, 1871 to Carrie M. Dunsmore, an operative, b. May 1848 in Eastport, ME, dau. of Nathan P. & Sarah Dunsmore. The had four children: Bertha Carrie b. 1874, Fred Clarence b. Apr. 13, 1875, Elmer H. b. May 3, 1877 – d. Apr. 29, 1887 and Sadie Florence b. 1879. 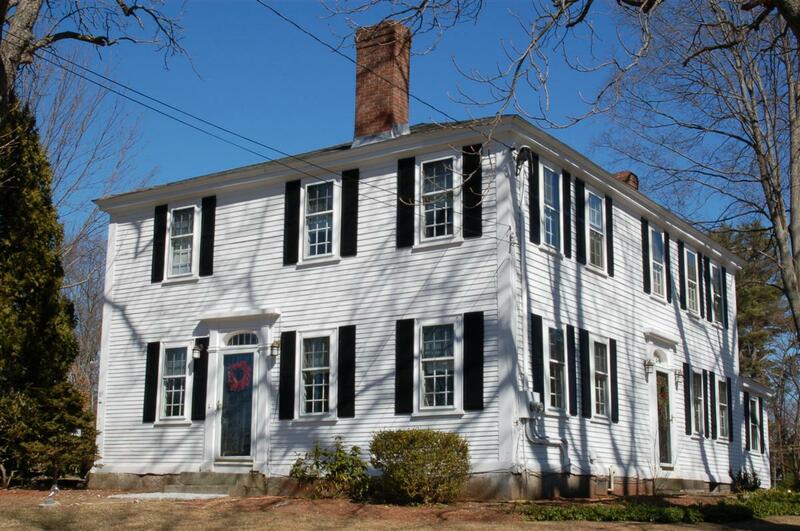 They moved to Tewksbury in 1880. Carrie died on June 4, 1884. Clarence remarried on Sept. 17, 1890 in Lowell, MA to Jennie L. Preble b. Aug. 1849 in Sullivan, ME, dau. of Benjamin & Hannah Preble. The 1900 census has Clarence & Jennie renting the house from his mother Mary. Mary died on April 11, 1906 and Clarence inherited the Flint Farm. Clarence farmed the land for 28 years. The 1920 Valuation of the house, barn and 54 acres was $2700. Clarence Way sold to William B. & Frances Corliss on July 9, 1923 who came to Andover to manage the Bliss Farm. William Burr Corliss b. Sept. 26, 1876 in Richford, VT, son of Omer Whitcomb & Adelia (Farrar) Corliss. William married on July 24, 1900 to Francis Emma Marvin b. VT. They had a farm on High Plain Rd. in 1920 and two daughters; Wilma Frances b. 1915 and Helen G. b. 1919. With the Great Depression of the 1930’s the Corliss family lost their farm to the Home Owners Loan Corp. in June 1939. The bank had held the mortgage since June 1934. On July 1, 1939 Vincent Treanor Jr. and his wife Dorothy (Neil) Treanor of Methuen, MA purchased the farm. They began restoration of the old homestead which continued for the next 64 years the family owned the property. An old two-story ell on the east side of the house, which was used as a milk room and housed a well was in poor condition, was razed. The foundation rebuilt and a new one story “Club room” built on the same footprint. The Treanors’ dream was to raise thoroughbred horses, so an existing wagon barn was reworked into a stable, a new barn built to store hay and grain, paddocks and fences built and thoroughbreds purchased. The farm named “Hobby Horse Farm” operated from 1940-1943 as a horse farm. With the beginning of WWII the horses were sold and chickens bred to aid in the war effort. The paddock was converted into a Victory Garden. The orchards and blueberry fields also added to the farm income. In 1956 an in-ground swimming pool was built, one of first in West Andover. The Treanors’ three children Vincent III, Susan and Edward all enjoyed the rural setting of their childhood farm. With the construction of interstates 93 and 495 through Andover, farmland in town slowly succumbed to developers for house lots. The Treanor’s original 69 acres farm also suffered the same fate. After the death of Dorothy in 1987 the children inherited the homestead and remained in their stewardship until July 2003 when they sold to William & Maureen Brogan. See 1980 National Register nomination for updated information Vol. 16.